Merry Christmas! For the third consecutive year, our family was out of town. Our dear friends, Chris and Beth, kindly hosted us for a La fête de Noël on the eve of Christmas Eve. The past two Christmas menus were inspired by holiday colors and signature holiday dishes. This year’s menu featured French classics paired with French vino. We are excited to share our celebration with you. We arrived to dinner with Champagne and Chablis in our whimsical Santa pants wine bag from Pottery Barn. Kanchana created a festive tabletop with Williams Sonoma’s nutcracker napkin rings, crisp ivory napkins and Bed, Bath and Beyond ornament place card holders. Olga from International Garden created our floral bouquet with ruby roses, red berries, brunia silver, magnolia leaves and silver acorns. We also dressed our wine bottles with Santa and reindeer wine toppers. 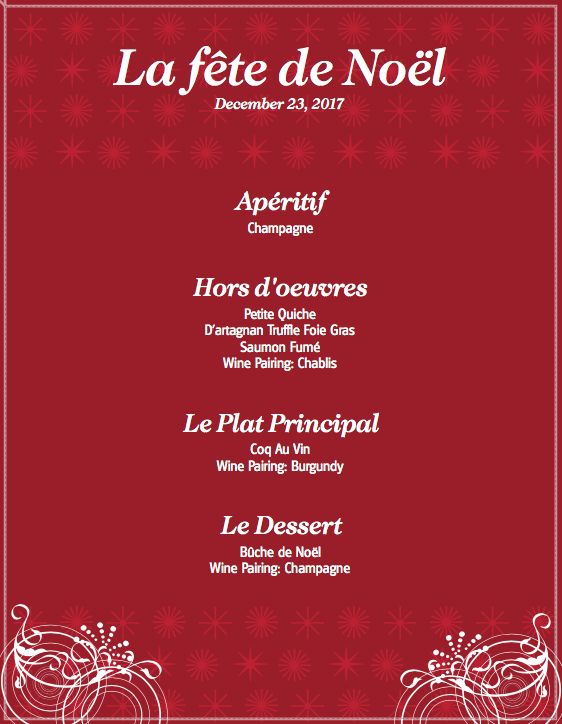 We created a festive French dinner menu. The meal started with an assortment of appetizers including Petite Quiche, D’artagnan Truffle Foie Gras and Saumon Fumé. We paired the hors d’oeuvres with a 2015 Chablis. Beth prepared Coq au Vin for the main course, which was paired with a refreshing Bourgogne. We concluded our meal with a slice of a Yule Log, paired with Billecart-Salmon Demi Sec champagne. Chris and Beth, thanks again for hosting our La Fête de Noël and letting us add some TWINSPIRATION!